There’s nothing quite like sitting for 5 hours in an uncomfortable seat with a fat, tattooed lump of a man reclining the seat in front of you, forcing a sharp ridge of protruding aluminium into your shin. The distance between my face and seat in front of me could literally be spanned by thumb and forefinger outstretched. This was Viking Airlines, the most shoddy airline I’ve ever experienced. The plane left Gatwick two hours late for no real discernible reason and no proper explanation given to passengers. There was no refreshment – even water – for free on a five hour flight (is that even allowed?) Air hostesses seemed more concerned by their lipstick than passengers and regularly knocked passengers in aisle seats. Viking – your operation is truly awful. My return flight with Viking was cancelled, so I had to book Easyjet for that leg instead – looks like that will be a good bet in comparison! 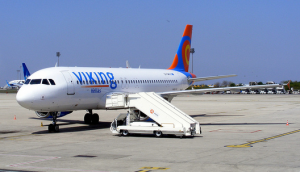 Ranking just behind Viking was my experience with Thomas Cook Airlines, well documented on this blog. At least the plane was better for medium haul – a Boeing 757 – but the only thing organised properly when passengers had to be shipped by bus to Ottawa was the letter telling us we would not be compensated. Thanks. Third in the list comes Ryanair. Here I’ve had one major negative experience – a flight cancelled from Karlsruhe-Baden to London and no alternative offered for 2 days. There’s also the general impression with Ryanair that they are setting out to wring every last penny out of you, and fluorescent yellow plane interiors and chronically uncomfortable seats don’t help. But all of that is balanced by tremendous value and, in most circumstances, flights that arrive on time. In fourth position comes Vueling, the Spanish cheap airline. Their website is good and the planes I took ran on schedule but seriously how can any airline have such a small seat pitch? Are Spanish passengers just shorter on average? Fifth place is awarded to Easyjet. The orange in the planes is little better than Ryanair’s yellow, but they fly to more normal airports, the seats are more comfortable and I’ve never had a negative experience with them. Ranking joint 6th – i.e. best among the cheap airlines I’ve used – are Germanwings and Wizz Air. Both of these companies have it just about right. Modern Airbus planes, comfortable but basic seats, enough space to sit comfortably, and routes to major airports. Both are simple, basic and efficient and you don’t emerge at the other end irritated or stressed. So there you have it – my subjective league table of cheap airlines! Can I add a couple of others? Turkish Airlines – “Globally Yours” – if that’s what’s out there then I’d prefer to stay at home to be honest. A note on Ryanair. Whilst all humans all share the same disdain for Michael O’Leary Ryanair flights aren’t always terrible. After much arm twisting I convinced my family to Ryanair to the Canaries – it was really ok ( save the yellow cabin), on time, helpful staff and really quite cheap eve after all the extras. Andrew – agree re. Ryanair. You’re quite tall though – don’t their seats give you a bad back? I wish someone would design a portable, extra pillow thing to add on top of airline seats to assist tall people’s heads! BTW, flew 5 hours with Easyjet yesterday from Sharm el Sheikh to London Luton. Excellent. Friendly staff, modern plane, enough space. Couldn’t fault it. And, unlike Ryanair, their seats are not solid plastic. @wg – thank you for the cheap shot, hiding behind a pseudonym. Yes, I fly too much, and I have often admitted it on this blog, and I offset the emissions. @Daniel – hmm, fair points there. I suppose if you travel enough with any firm you will encounter something going dreadfully wrong! With Wizz-Air, you might just been lucky. They are fine, as long everything goes as planned. But as soon there is a flaw in the system (which can happen very easily in this sector), their business system of no buffers leads to huge delays and endless annoyances for passengers. Their information policy is worse than everything else you’ve been criticising on this blog before (incl. Eurostar) and their customer care is a digrace. Once, I had a return fligh Charleroi-Budapest booked. The plane was cancelled, the only direct alternative they offered was 4 days later, on the they of my return flight. I ended up flying via Bergamo with one day stay there – I had to pay for the ticket (with RyanAir) to Bergamo and for the hotel (which I had to book myself, no assistance whatsoever was given). It took me more than three (!) months to recuperate my expenses as opposed to the 14 days they told me at the airport. I had to put up a huge fight to receive the entire amount (more than 300 EUR) and not just 75 EUR they offered to pay… I only got back the expenses I had, no compensation whatsoever. As a consequence, I avoid flying with WizzAir not at any cost, but whenever possible. From those airlines you mentioned, I had basically always good experience with Germanwings and also with EasyJet (but I admit, I have not been flying too often with the latter). Well, you’re really concerned about climate change. Shouldn’t we all be behaving in a more responsible manner.